An overly-enthusiastic gamer who allegedly attempted to steal the code for Atomic Games' Breach on the PAX East show floor was foiled and apprehended by authorities. If you play a game at a show like PAX East 2010 and really, really like it, there are many ways to show your appreciation. You can go to a store like GameStop and preorder it, you can post about how much you loved it on forums to build hype, or you could send the developers a nice card and some chocolates if you want to be a bit too enthusiastic. Or, if you're one PAX East '10 attendee in particular, you could try to steal the code for the game in question so that you and your buddies could play it well before it comes out. 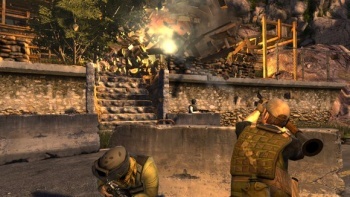 That's what allegedly happened with one gamer and Atomic Games' Breach, anyway - Joystiq has the full story and it's a doozy. To make it short: The suspected thief was spotted while connected to an ethernet cable at the Atomic booth, ran into the (very, very large) crowd, and was apprehended. "The suspect did admit to us several times, including as he was doing it, that he was stealing the code. He said to myself and several other team members, after being caught, that it was not a big deal, he just really liked the game and wanted to play it with his friends," explained Atomic spokesman David Tractenberg. However, the alleged thief maintains that the Atomic version isn't correct. He told Joystiq that he was merely trying to use the ethernet cable to get online at the Hynes Convention Center since the WiFi wasn't working (which, as anyone at PAX knows, is certainly a plausible turn of events). "They stopped me, checked my computer, and saw the Xbox Neighborhood application," he told Joystiq via Xbox Live. "Because that was on there, they accused me of stealing Breach, even though it's not on my computer." The suspect's electronics - including "laptops, modded Xbox 360, modded PSP, modded DS and XMP3" - were confiscated by police, and he spent four hours in jail following his arrest, so if there is any trace of Breach there, it'll turn up sooner or later. Tractenberg also said that despite the two conflicting stories (he was just trying to download it to play with friends / he was just trying to get online) the alleged perpetrator claimed he could give names of accomplices: "He said several times he 'knew people' and 'could give us bigger and more important people' and he could 'name names.' However, I have no idea if these people were on the show floor or just hackers at home," said the Atomic rep, adding that he "would hate to think he got someone's full code and their title is going to be compromised due to this guy." "While it's a very unfortunate incident, it was a form of a compliment that he liked our game so much he risked a felony to play it early. Since we work with the military and intelligence communities, though, we had no choice but to have him arrested and protect our IP." But oh wait, it gets even better: The very same suspect was at a panel earlier at PAX East with Stephen Toulouse, director of policy and enforcement for Xbox Live, during which he asked if he could please have his Gamertag unbanned from the service. When asked why he'd been banned, the alleged thief said that he'd played Forza 3 early - and as it turned out, it had been an illegally downloaded copy of the game, too. Okay, it's true that we do have the whole concept of "innocent until proven guilty" here, and should wait until the facts come out in a court of law... everything about this is fishy. You have conflicting statements about what he was doing from someone who had a bevy of modded consoles. You have someone who is not only a self-admitted pirate (bad enough in itself) but who is also dumb enough to illegally play Forza 3 online before release and then ask Stephen Toulouse if he could be unbanned for it. If you're innocent, then I apologize in full, but I'm sorry, Mr. Suspect, you're getting no sympathy from me on this one. Though let's be fair: Atomic is clearly at fault here, too. I mean, they named their game Breach - that's practically asking for it! Update: Guilty von Dumbass has skipped out on his court date. Ouch.